Why is it that there so many people losing money in Forex investments? Why is it there are so many people investing in Forex yet still loss money? This is because they have not found a proper way to make money in Forex. Spending a few years learning on how to make money in Forex but yet to find a correct way to make money in Forex.? Is it really that difficult making money in Forex? How come those novices are able to make money in Forex? Actually, investing in Forex is not that complicated as you perceived it to be as long as the key principle investment method is correct. 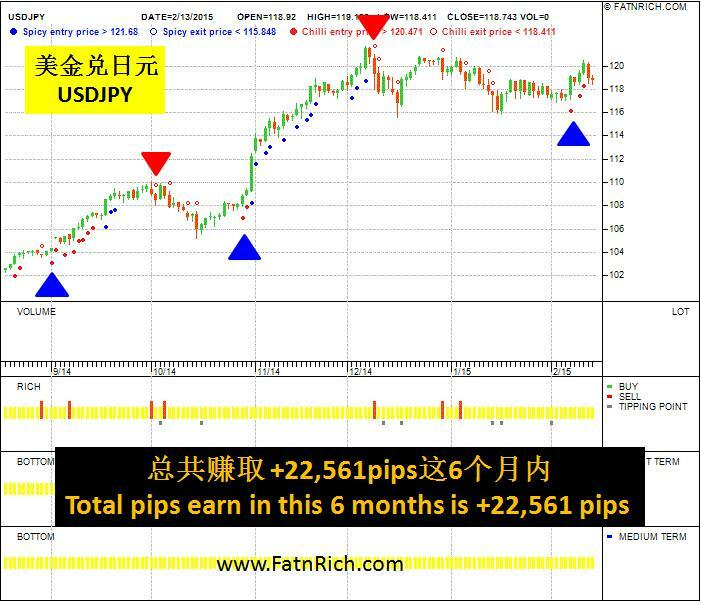 Based on the chart above, according to Spicy Chilli signal USDJPY make a profit of 22,561 pips within 6 months. With the high accuracy signals provided by INSIDERS, making money in Forex is no longer a big deal for both novices and professionals. Spicy Forex 1 day training course will be held on 11th March 2015. We will guide you on how to trade in Forex successfully*. This entry was posted in Forex and tagged currency exchange, Forex, insiders, investment, investment software, investment tools, profits, USDJPY. Bookmark the permalink.